The ability to extract high quality DNA and RNA is essential for expanding our understanding of molecular pathways, and has become particularly important with the advent of next-generation sequencing methods. As the sequencing technologies have advanced in the past decade, so have the strategies for DNA and RNA purification. Magnetic nucleic purification using superparamagnetic beads is more specific than traditional column-based separation methods, and can decrease isolation time, increase throughput, enable automation, and expand options for point-of-care diagnosis. 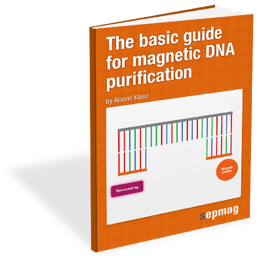 We have prepared this magnetic DNA purification guide to help you gain a deeper understanding of the process, familiarize yourself with the tools available, and look forward to future possibilities. Superparamagnetic particle coatings and surface chemistries for nucleic acid capture.